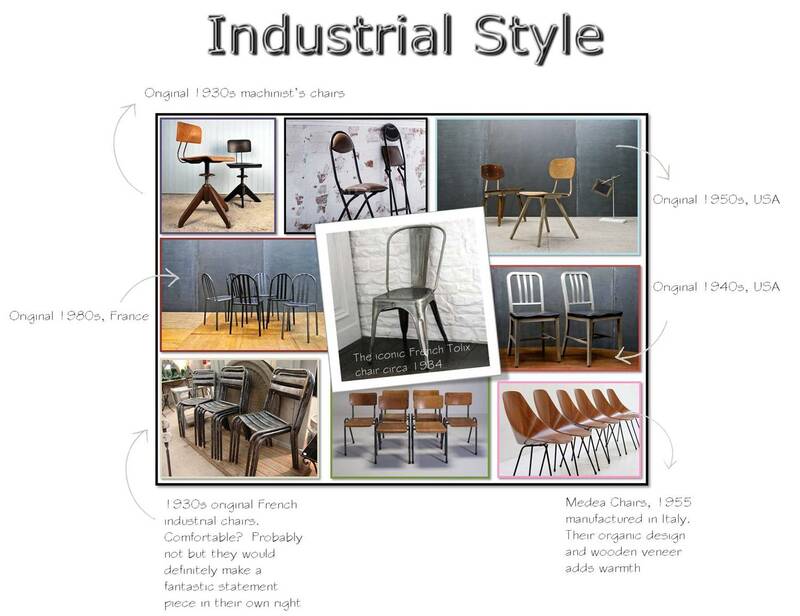 So Many (Industrial) Chairs, So Little Time! As we all know, I’m completely consumed with all things industrial at the minute; thanks to my lovely space planning module. Industrial styling is an extremely contemporary, edgy and urban look that needs to be given careful consideration to prevent any design scheme from appearing too cold, harsh and void of character. So that’s primarily why I’m going to combine industrial with Georgian styling. My intention is to soften the hard edges of the industrial with the more refined and elegant characteristics of the Georgian. Sounds great in theory; I can only hope that it works in reality (or virtual reality once my 3D visuals have been finalised). So, being the ever conscientious student, I conducted research on the varying styles of industrial seating – I would like to include industrial styled seating in the waiting area of the reception in County House, High Pavement. Now, now, hear me out before you all start gasping in horror! Whilst these little gems are quite rustic and steely in appearance they undoubtedly add an abundance of character within a contemporary design scheme. Trust me. However, as always I intend to add a little bit of my own creative flair just to make sure that their coolness is counter-balanced… keep reading! Obviously the origins of these chairs lie in the manufacturing industry, hence their usual ‘industrial’ reference. They were designed to meet with the specific needs of the factory or warehouse that was to be their new home. So I’m assuming that they had to be lightweight, stackable and hardwearing. However, it’s because of their minimal aesthetic that they continue to be admired and incorporated into many contemporary residential and commerical interiors; not only in a practical manner but also as statement pieces. And obviously the vintage finds offer much in the way of character and urban chic because of their individuality and distressed appearance. 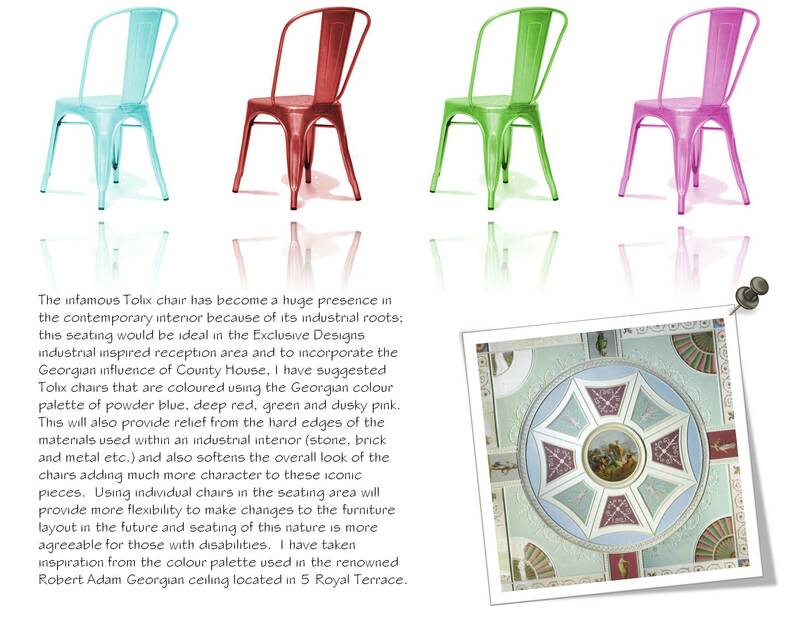 So after careful thought I chose the iconic Tolix chair as one of my furniture options for seating within the reception area. There are many variations available that include a spectrum of hues and for this design concept I’ve decided to use four of these chairs incorporating the Georgian colour palette. Genius!! I’ll let my little illustration below explain my rationale further. I’m currently working on 3D visuals for the reception area of County Hall that will include the reception desk, lighting and seating and I will ensure that they are posted to my blog as soon as they have been completed: so stay tuned! Excellent choice, Anita. I am a total Tolix fan!